Foreword. Preface. Introduction: The solubility of solids in liquids. Magnesium chlorate. Magnesium bromate. Magnesium iodate. Calcium chlorate. Calcium iodate. Strontium chlorate. Strontium bromate. Strontium iodate. Barium chlorate. Barium bromate. Barium iodate. System index. Registry number index. Author index. 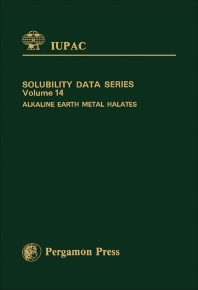 Solubilities of the chlorates, bromates and iodates of the alkaline earth metals (magnesium, calcium, strontium and barium) in all liquid solvents are presented in tabular format and critically evaluated. This is the first of four volumes in the Series covering the inorganic halates, and provides essential data on these important industrial reagents. For physical, analytical and inorganic chemists and chemical engineers.